Ninety years ago, today was the day before Rosenberg’s death. I feel lucky and priveleged that my tribute to him “Specimens of Desperate Attempts: Sketches from the Life and Death of Isaac Rosenberg” will be coming out in the next few days. 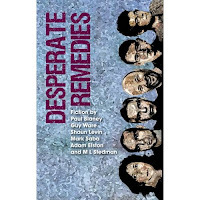 It’s part of a new collection of short fiction, Desperate Remedies which is going to be launched at a Short Story Festival at Foyles Charing Cross. Because the piece is from the Whitechapel Boys work in progress, which is very much in progress, Rosenberg is still alive for me, still struggling to be recognised, struggling to write poetry and plays, hoping to get through the fighting in the trenches so that he can use everything he has gone through to create what would be his best work. That’s how he felt. And then on April Fool’s Day 1918 he was killed. What is it good for? Absolutely nothing. An exhibition of Rosenberg’s paintings opens tomorrow at the Ben Uri Gallery in St John’s Wood.